The countdown to Christmas is well and truly on and with it comes a mix of excitement and stress. Whether it’s wrapping the presents, getting all the food in for your festive feast, signing off on important projects at work, or hunting down the perfect Christmas tree, the holiday season can be a tough one to tackle without your anxiety levels skyrocketing. From keeping track of presents to staying sane, these apps are the perfect little helper you need to stay stress free this Christmas. When you’ve got a big family, lots of friends, and let’s not forget the work secret Santa, it can be very hard to keep track of all the festive gifts you need to tick off the list. With Santa’s bag, Christmas gifting has never been easier or more fun. You can create a list of gift recipients, set a budget for each person, brainstorm gift ideas, and track your progress. If you’re the type of person who prefers to order gifts from the comfort of the couch, Deliveries is the app for you. Gone will be the days of being stuck in the window on Christmas Eve, anxiously awaiting that video game you pre-ordered. Deliveries keeps track of all your packages and even offers a countdown to their expected arrival dates. Do you plan on having some family and friends over for a Christmas party, and are looking for a new recipe to add to your cookbook? Introducing Tender, like Tinder, except for food. Swipe right for the recipes you want to save and left for those you aren’t interested in. Christmas is a busy time – between work deadlines and life commitments, it can all become a bit too much. If you’re about to hit boiling point, take a few minutes and plug in to Calm. Calm is one of the most popular mindfulness apps on the market. The easy-to-use interface offers guided meditations, sleeping and breathing programmes, and relaxing music. 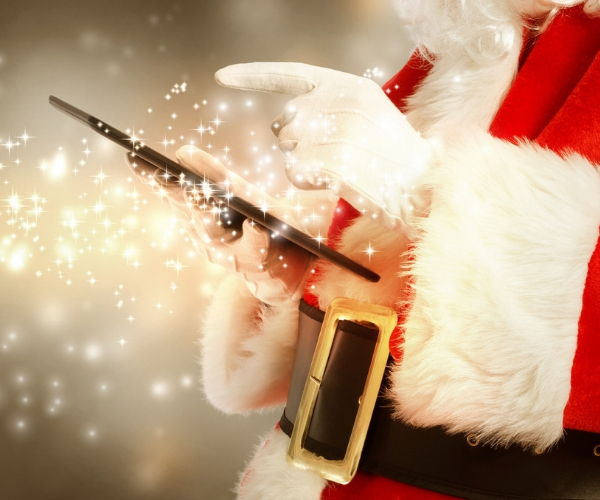 If you love getting your jingle on at Christmas, this is the app for you. The Christmas Radio app lets you choose from over 50 festive radio stations. Whether you fancy a bit of Christmas Carols, or perhaps you’re in the mood for some Kristmas Kountry, this app has something for everyone. How many times have you drafted the Christmas card recipient list only to forget to send half the people on it a handwritten greeting? Meet Elf Yourself, the fun way to send a festive e-greeting. Simply upload a photo of yourself, your family, your friends, and the app will transform you all into elves dancing along to some extra-cheesy Christmas tunes. You can then send the video in an email or upload it to your social accounts.